Today's the day we start putting this thing together! The first step is to put an edging on all of the blocks so that they all have the same number of stitches along each side. NEW skein of worsted weight yarn so that you don't run out during this process. 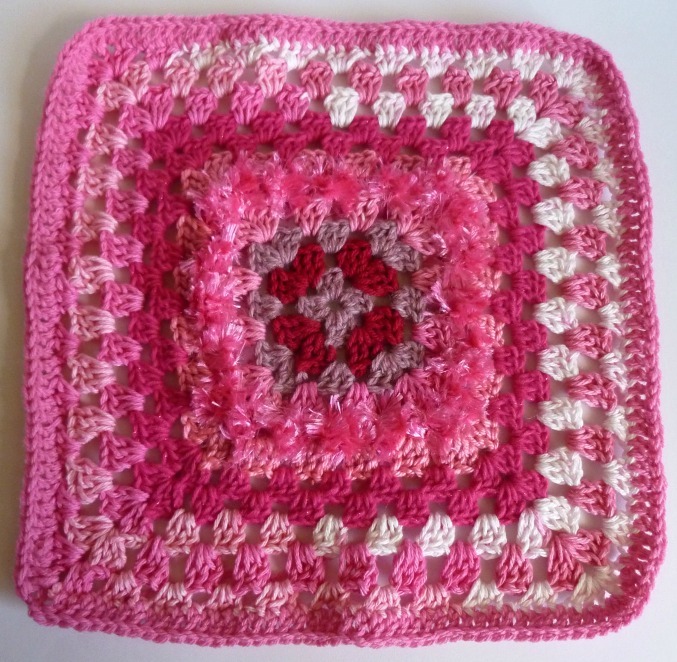 **The rest of the blanket can be crazy and non-matchy, but being really picky about this part means that the blanket looks expensive and handmade. If you were to make this quilt in crazy rainbow colors, it would all still come together as long as you do all of the edgings from the same skein of yarn. 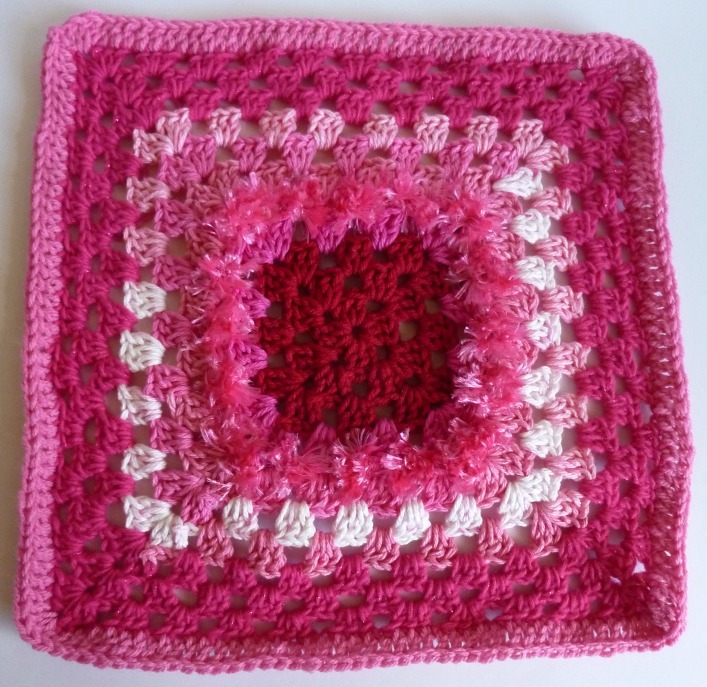 ** I used a giant one pound skein of pink Red Heart acrylic, just to make sure I had enough. It turns out that a whole pound was overkill, and I'm going to have pink yarn forever, BUT all of my edgings look the same! Overkill is sometimes just right. Repeat with all 9 blocks. 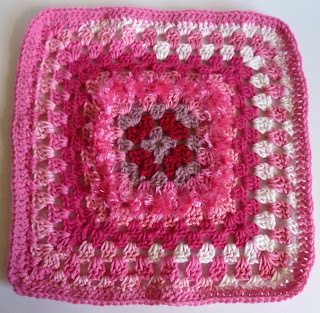 Because of the number of blocks that I had you make, you're going to put a granny square block in each corner, and the center, with the embellished blocks filling in between the grannys. I probably played around with placement for 20 minutes, making sure I liked the way that the blocks looked together. I flipped them around, tried them upside down and sideways, shuffled them until I was really happy with the way that it looked. Please take the time to make sure that you love the placement of your blocks before you move on from this part. So, do you adore the way it's looking? Great! Let's stitch it together. Grab your G hook and your edging yarn. 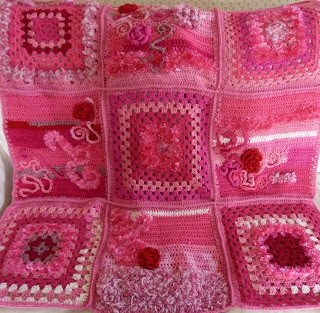 Single crochet your blocks together. 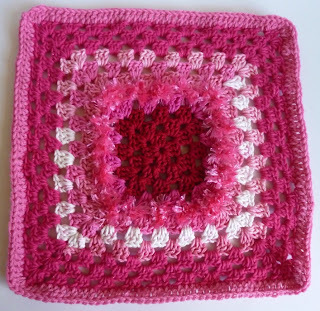 It should be really fast and fun, since all of the hard work of making sure that your blocks have the same number of stitches was done in the last part. It will go really quickly. I single crocheted the two vertical lines first, and then went back and did the 2 horizontal lines. The stitch lines should look really clean and neat, which is a great contrast to the whimsy that we've got going in the blocks. That's enough for today! Tomorrow we're going to finish it up! This really is beautiful... makes me glad I'm a girl!